I do love a good crumble, I can pretty much make a crumble mixture by eye these days but just for you I’ve measured out the quantities (I’m good to you aren’t I?). 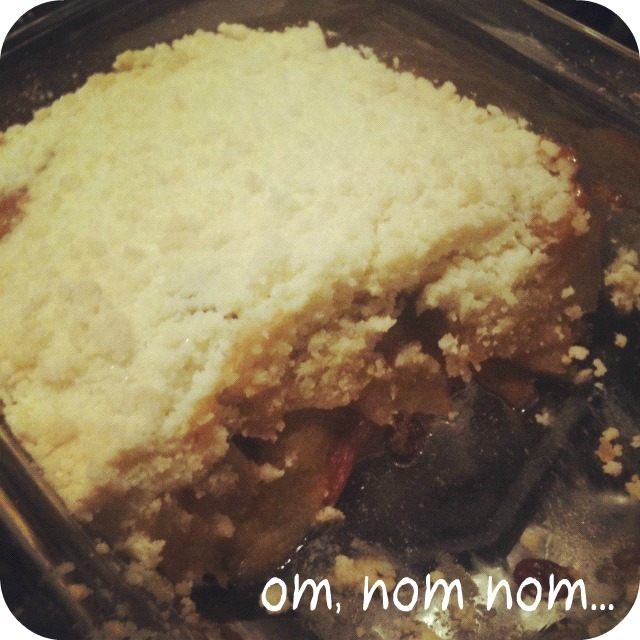 Crumbles are the ultimate comfort food and served with custard can make many a grown man, or woman, weep with pleasure. 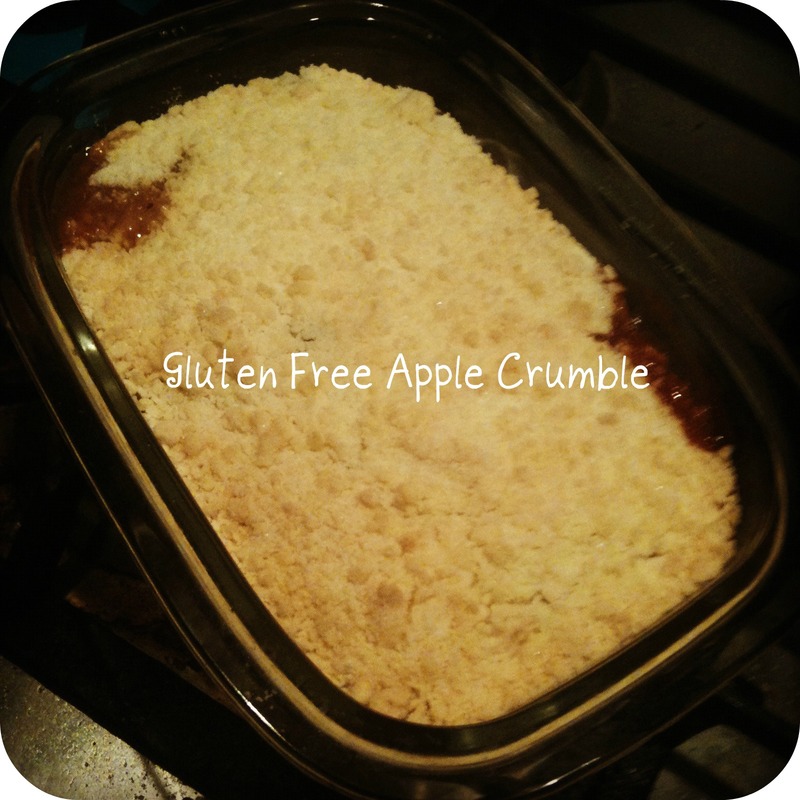 It’s a simple recipe and just as easy to make gluten free, if you aren’t a coeliac then just substitute gluten free flour for the ‘normal’ stuff. I’ve made an apple one here because I’ve been popping down to my local market of late and getting the bargain of all bargains on big fat juicy Braeburns of 10 for a pound, can’t say fairer than that can you, but one can only eat so many apples a day in their raw form, so a crumble was in the offing from the moment those apples hit the bag. You could use any fruit you like with this recipe, a bit of forced rhubarb would be nice or if you are making this at the end of the summer a few hedge picked blackberries in with the apples would go down a treat. Right, enough waffling and onto the recipe. Pre heat the oven to 200 degrees. Peel and chop the apples roughly then stew in a pan with the sultanas, cinnamon, agave syrup and a splash of water until tender. Pour apples into dish. 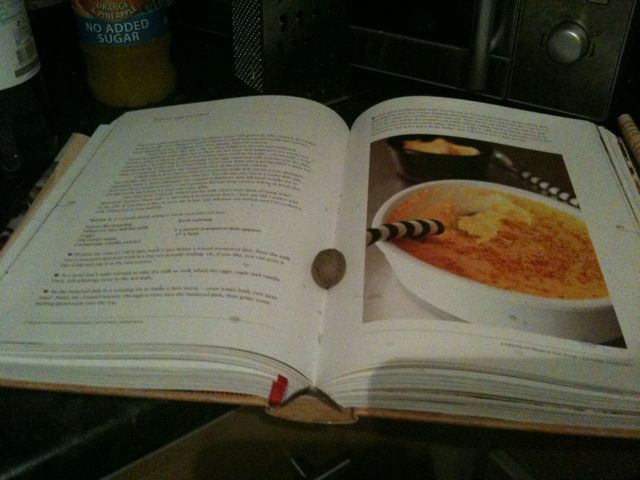 Rub the butter into the flour until you have crumbs. Add the sugar and stir. 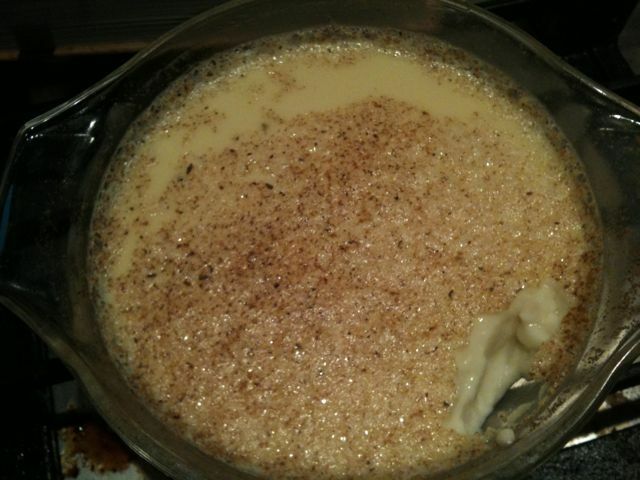 Then sprinkle the crumble mixture on top and shake to settle. Bake in the oven for a bout 30/35 min until starting to turn a light golden and the apples bubbling up from the bottom. This is a combination I spotted in my new purchase the ‘Flavour Thesaurus’ by Niki Segnit, my current bedtime read, I hope to blog more about it soon. I had once tried some delicious cardamon milk chocolate and wanted to make something custard based as a dessert so I had a go at experimenting and out came this. 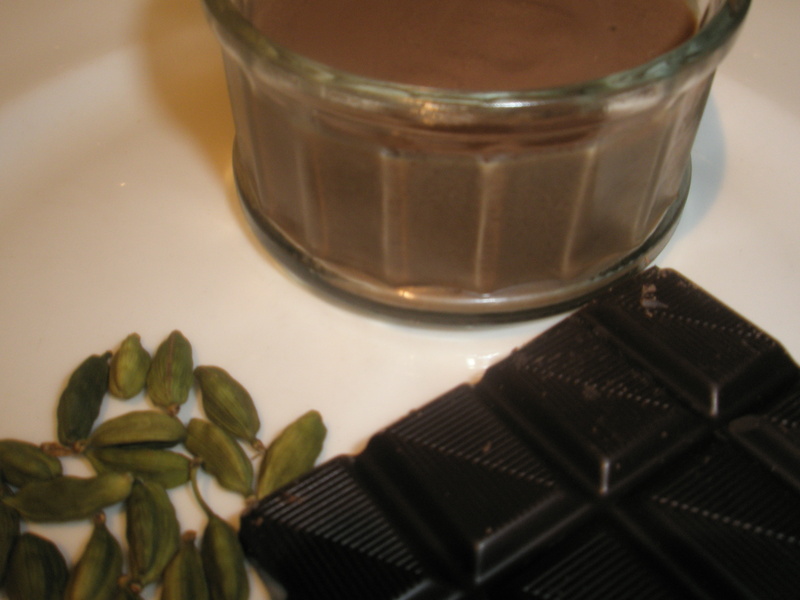 The result adds a gently fragranced characteristic to a smooth chocolate custard which forms a very pleasant end to a meal. This makes about 2 and half little ramekins worth so double the quantities if you need more. 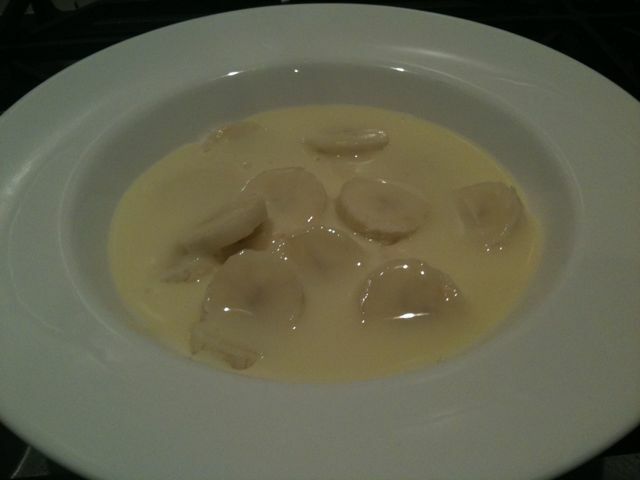 Mix the egg yolks, cornflour and sugar in a bowl. Heat the milk with the crushed (or split) cardamon pods gently until hot, you don’t want it to boil. Add the hot milk to the egg yolk mix and whisk together then return to the pan and heat very gently stirring continually. Keep going, be very gentle with the heat as you don’t want scrambled eggs, then take off the heat once thickened. 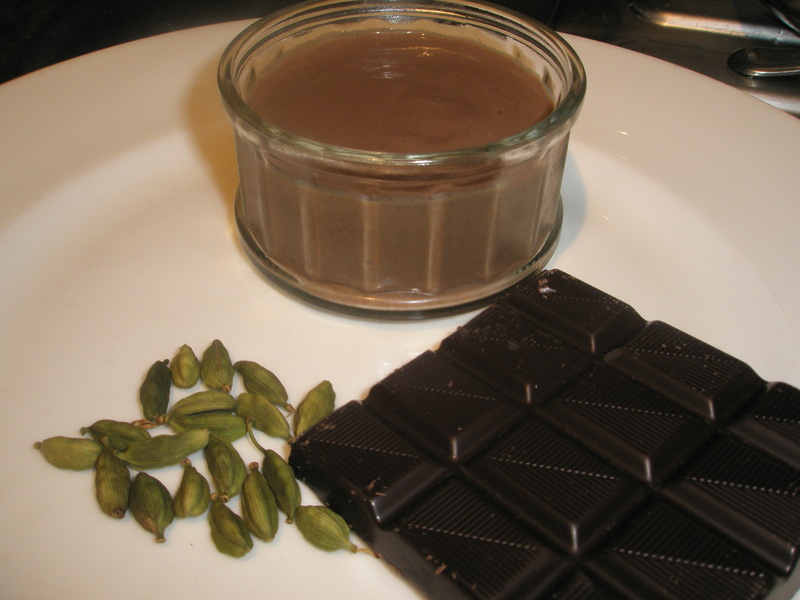 Add broken up chocolate and stir. Pour into little bowls or ramekins and then chill thoroughly in the fridge. Clearly any wastage is up to you to dispose of as you will, but lets just say there is plenty of opportunity for licking the spoon and scraping the pot! 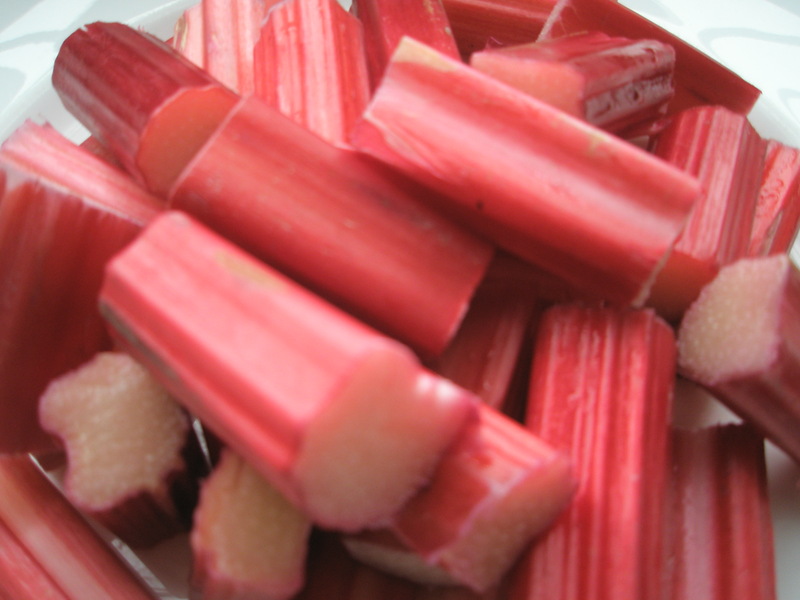 I love rhubarb, I love the word rhubarb, I love the colour of rhubarb, I love the taste of rhubarb. In memory of my one of my favourite childhood cartoons I was going to make Rhubarb and Custard but in the end I just made a compote. However, this would work really well with custard, cream, panacotta, all sorts of things really. I ate some last night with some pan fried mackerel fillets and some sauteed potatoes. I also then snaffled some up warm with ice cream and today I think i might make a little fool out of the remaining compote, some cream, vanilla and a little sugar. This compote is super easy to make and as you can see from above goes with lots and lots of different things. Pop all the ingredients in a pan and cook gently until Rhubarb is tender but not completely collapsed. Sugar wise, I shook some in from the jar, rhubarb can take quite a lot so taste as you go, you can add more at the end so keep trying and you’ll find your perfect balance. Serve warm as a dessert with custard, french toast, cold with panacotta, mixed with youghurt, cream or as a sweet and sour element to a nice bit of mackerel as described above. I really don’t have much time tonight, so I won’t share what rubbish I ate for dinner but I did have room for a super simple dessert that is more a reminder than a recipe. This is such a lovely, comforting dish. I guess its very much nursery food and me and my little girl tucked into this just before her bedtime. 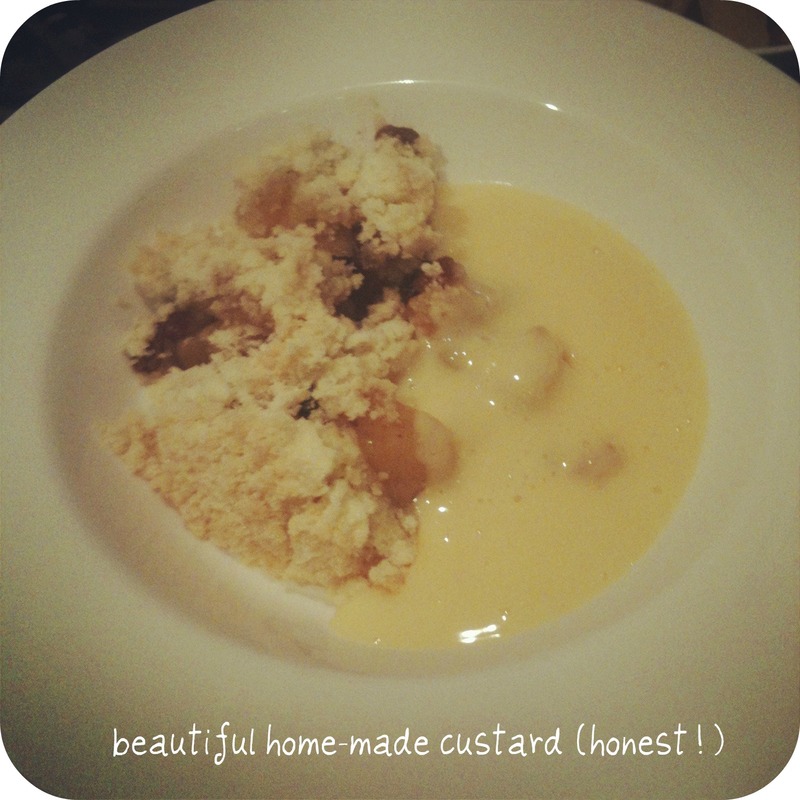 Custard – it would be simply wonderful if you could make this, i didn’t! Warm custard. Slice bananas and put in a bowl. Pour over warmed custard. Leave for a few minutes to cool and eat lukewarm when all the lovely banana flavours have mingled with the creamy custard. I’m afraid this is another of Nigella’s but I halved it in order to stave off my greediness! Butter a dish big enough to hold the mixture. Whisk together eggs, sugar and vanilla. Heat milk til hot (not boiling). Whisk into egg mix. Pour through a sieve into dish. Put dish in bain marie. Cook in oven for about an hour. This is the perfect comforting Sunday night dessert. Eat warm and then cold the day after, mmmm….